8I am the LORD: that is my name: and my glory will I not give to another, neither my praise to graven images. There is not a more damnable doctrine in Roman Catholicism than the teachings of Our Lady of Fatima. Roman Catholic officials claim that a supernatural event occurred in 1917 in which the Blessed Virgin Mary appeared repeatedly to 3 little children in Fatima, Portugal. Supposedly, the Virgin Mary gave a message to the 3 children—Lucia, Jacinta and Francisco—consisting of an alleged number of precise predictions, requests, warnings and promises concerning the Catholic faith. An "apparition" means "the unexpected or unusual appearance of a ghostly figure." Blasphemy!!! You cannot show me even one Scripture from the Word of God where we are told to trust in Mary, by reciting the Rosary to be saved. 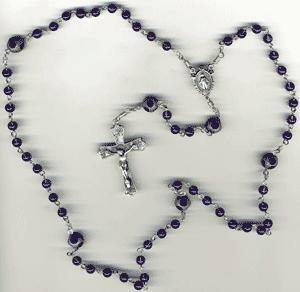 In fact, the word "Rosary" is NOT a Bible term. The Rosary is straight out of the pits of Hell. Jesus condemned vain repetition in Matthew 6:7. How could Catholics be so arrogant, so blind, and so apostate as to believe that salvation is found in Mary? I tell you, Catholicism is of the Devil. The Gospel of Jesus Christ has absolutely nothing to do with Mary. None of the Apostles ever mentioned Mary in their Epistles. Jesus never directed us to recognize Mary. In fact, the Bible clearly states in Matthew 11:11 that there has never been a child born amongst women greater than John the Baptist. 11Verily I say unto you, Among them that are born of women there hath not risen a greater than John the Baptist: notwithstanding he that is least in the kingdom of heaven is greater than he. And no wonder, because John the Baptist prepared the people for the coming of the Savior—Jesus Christ, the Lamb of God which taketh away the sins of the world (John 1:29). That's a BIG LIE!!! The Vatican has a lot of explaining to do, because something smells very rotten. One of the most unholy groups in this world is the Holy See, i.e., Catholic leadership. They wrote the book on self-righteousness. 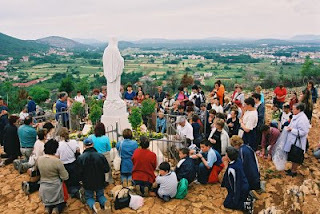 No devout Catholic dare deny the promises of Our Lady of Fatima, i.e., their Blessed Virgin Mary. The Catholic Mary (which is nowhere even close to the Biblical Mary) claims to have the power to save those who recite the Rosary. No wonder Catholicism's Mary is often referred to as The Great Whore. Catholics have mutated Jesus' earthly mother into a two-headed, fire-breathing, demonic, monster. and told others to do what Jesus commanded. The Blessed Virgin Mary of the Catholic religion is straight from Hell. Oh! Listen my friend, the Catholic Church is a prisonhouse of religion! Catholics have churchianity without Christianity, and religion without truth. From the cradle to the casket, the Catholic Church offers people a package deal; but it's a guaranteed road straight into the depths of Hellfire and damnation. In Luke 17:21, Jesus stated that the Kingdom of God is within you; not within a religious organization. Many people want an organized religion that allows them to touch, taste, see, and feel what they're trusting in for eternal life. However, true salvation, which is obtained only by faith in Christ Jesus, is of the heart.